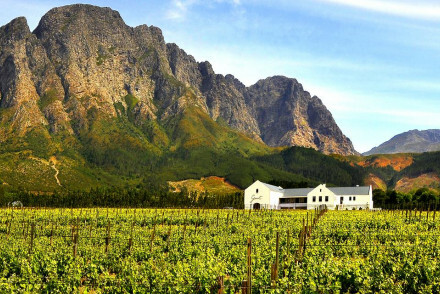 Franschhoek is one of the oldest towns in South Africa and only a short hop from Cape Town. Visit to explore the rustic vineyards, Dutch architecture and beautiful scenery. Many of the vineyards have French ancestry, not to mention French names, and each have fascinating stories to tell. What’s more, restrictions on new developments have created an architectural time capsule that shouldn’t be missed. 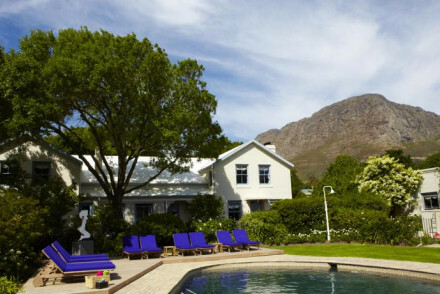 Our recommendations will show you the best places to stay in Franschhoek to enjoy this rural gem. 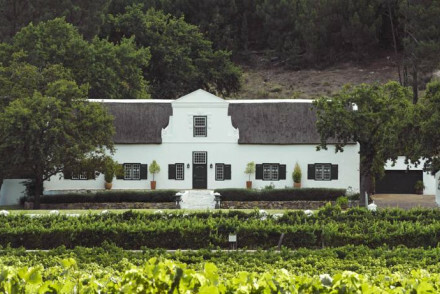 Boschendal Manor & Winery - Taste some fantastic wine in an idyllic location, and maybe even hear a bit of history. Franschhoek Wine Tram - Just what it says on the tin. Spend a day hopping on and off the tram at all the best vineyards for a day you won’t forget (hopefully…). Franschhoek Pass - Rent a car and drive around the valley to see some of the most spectacular views in Southern Africa. Tour guides can be hired. The Franschhoek Motor Museum - If you need a break from wine tasting, the motor museum will take you through a hundred years of automobile evolution with some breath taking vehicles. The Huguenot Memorial Museum - Learn about the history of the French Huguenot settlers who came to the area. Visitors can also enjoy the beautifully landscaped gardens around the museum. 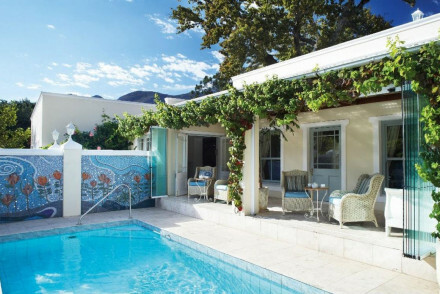 Our selection of the best places to stay in Franschhoek ensure that there really is something for everyone in this charming and historic town. 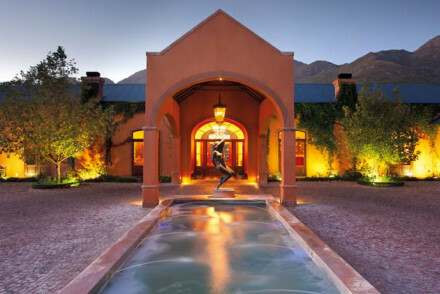 La Residence, Franschhoek is a visual feast, with impressive antiques, exotic paintings and palatial decoration. Each of the 16 suites is decorated like a Maharajah’s palace - or Versailles, and there’s an indulgent looking dining room and an award-winning spa. Le Quartier Francais houses a superb restaurant which is extremely popular with locals and visitors alike. Private pools, colourful decoration and a friendly reception. Sitting in between the Franschhoek Valley and the Stony Brook River, Holden Manz is a spacious, five room country house with a fantastic kitchen and a spa that we really take you away from it all - though you sort of already are. Basse Provence Country House boasts traditional architecture and comfortable suites, great for families. Just out of town you'll find the charming Lekkerwijn It's an elegant country house with ten bedrooms and gorgeous pool for relaxing after a hard day's wine tasting! Prices start from as little as £60 per night. La Petite Ferme is within reach of the town and also offers fantastic views and a highly renowned restaurant. 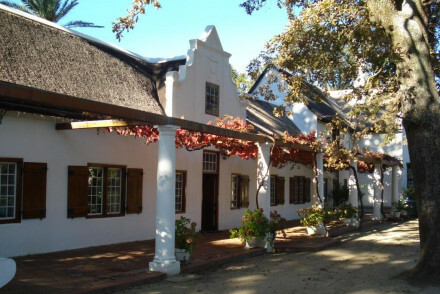 Rickety Bridge Manor House sits within Rickety Bridge Wine Estate and has a particularly intimate feel. Beautiful traditional architecture and an outdoor pool, not to mention a great name! 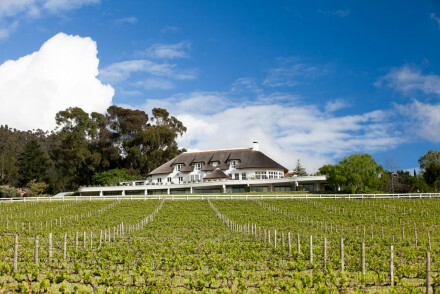 Also in the Franschhoek Valley, the Leeu Estates are in the middle of a beautiful, working vineyard. 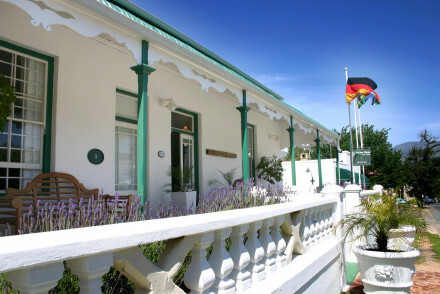 The hotel has been converted from an elegant, 19th century manor house and the decor is both colonial and Africa, Both the dining and the wines are fine. The rural Mont Rochelle is well known for its restaurant and comprehensive spa. 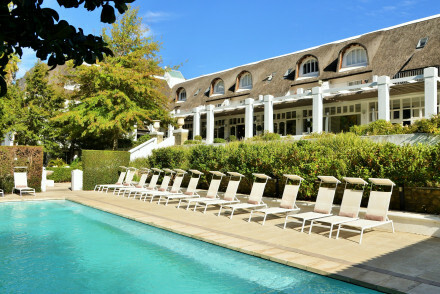 Le Franschhoek Hotel & Spa has light and airy bedrooms, movie star mirrors, a fantastic spa and simple but delicious menu. 21 Roux Street only has three suites and will make you feel right at home. In amongst the well kept garden lies a beautiful swimming pool to cool off in. If you prefer your own space, don't hesitate to visit our online partner Booking.com for a great range of cottages and villas located fantastically for exploring the local wineries and sights. Fly to Cape Town International Airport, located 88km (54 miles) from Franschhoek with a large range of domestic connections alongside several international carriers. To get the best of the weather aim to visit between November and February. If possible try to avoid going between May and September as it can get quite chilly and there’s likely to be a good deal of rain. 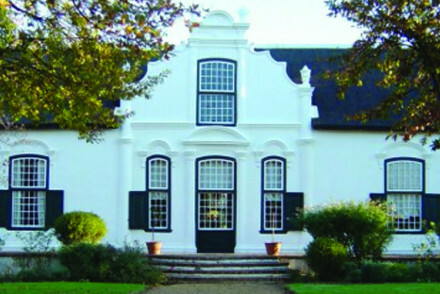 Lekkerwijn is set in a 17th century country house, nestled in the valleys of Franschhoek. The charming rooms are decorated in a period style with antique furnishings-or you can choose to stay in one of the rustic-chic cottages. Relax in the sun by the pool! A fantastic family retreat. Value chic - An elegant coutnry house, surrounded by lush gardens at a great price-what more could you ask for? 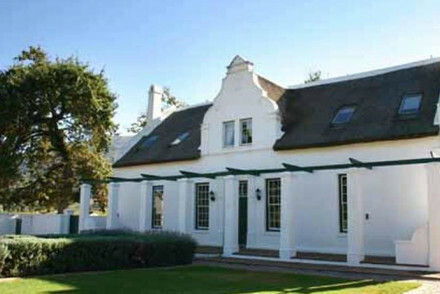 Quintessential thatched Cape Dutch style building dating back to 1855. Comprised of seven homely suites, some featuring in room bathtubs. In addition there is a two bedroomed cottage - ideal for families. Outside there is a pool with vineyard vistas and plenty of walking trails. Sights nearby - Franschhoek town is just a scenic walk or short drive away. Great walks - Along the Franschhoek River. Dating back to 1904 this traditional Victorian broekie-laced hotel provides intimate accommodation just of Franschhoek's pretty high street. Each of its eight rooms are filled with original features such as exposed beams and roll top baths, the best have a private hot tub. A great value stay. An authentic agritourism with all produce grown on the farm and served in the restaurant. Self-catered cottages are impeccably styled with soft hues, clean lines and luxurious bathrooms. Perks include a farm spa and many wine-focused activities. An indulgent rural escape. A 79 room hotel with a homely boutique feel. Light filled bedrooms are extremely comfortable, decorated in soft palettes and featuring sparkling bathrooms with movie star mirrors. A delectable breakfast spread is served as well as a seasonal à la carte menu at DISH. Camelot spa is not to be missed. Great walks - Traverse the Hottentots Holland Nature Reserve. Famed vineyard with gourmet restaurant La Petite Ferme's hotel could not be anything but superb. Suites decorated in soft palettes feature breathtaking pastoral views, and some private plunge pools. Located within easy reach of the charming town of Franschhoek and even more excellent restaurants. Great walks - A downhill stroll wander into the quaint town of Franschhoek. Sights nearby - The French Huguenot's memorial is just a short walk away. This beautiful guesthouse provides just three rooms - thoughtfully decorated suites. Featuring antiques, pastoral paintings and other classic decor touches. The garden is Mediterranean in style and picture perfect with an inviting pool. No restaurant but a delicious breakfast is served. Sights nearby - The French Huguenot Monument is within walking distance. An intimate three bedroom manor house, located within Rickety Bridge Wine Estate. Ensconced by the Franschhoek Valley and verdant vineyards. Charming rooms, up in the rafters feature exposed beams, antique furnishing and roll-top baths. There is an outdoor pool and homely sitting rooms. Great walks - Along the nearby Franschhoek River. Nestled up upon a hill of 'koppie' above Franschhoek's charming high street, this stylish home turned hotel, provides stylish accommodation surrounded by 125 acres of fynbos. 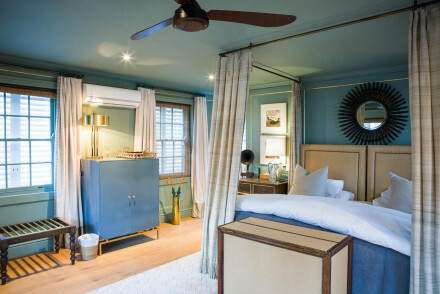 Each room is uniquely designed, with quirky interiors: think exposed brick and rattan beds. Exquisite al fresco dining. Locals flock here for brunch, lunch and dinner; tourists scramble for a room. Twenty-one colourfully decorated rooms feature gorgeous upholstery and some, private pools. There are three in-house fine dining options plus plenty more right on your doorstep. A firm Franschhoek favourite. Restrictions on children - Children cannot be accommodated at this hotel. 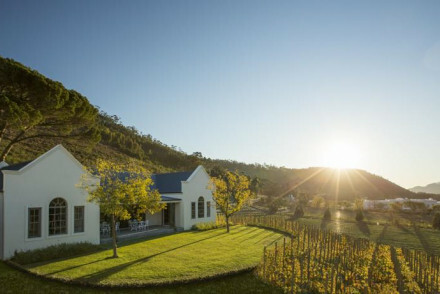 Holden Manz is situated on a wine estate between the Franschhoek and Stony Brook rivers. This country house offers spacious accommodation and smart bathrooms, whilst their Franschhoek kitchen serves up absolutely stunning dishes for you to try! Relax in the sun by the pool. A top country retreat. 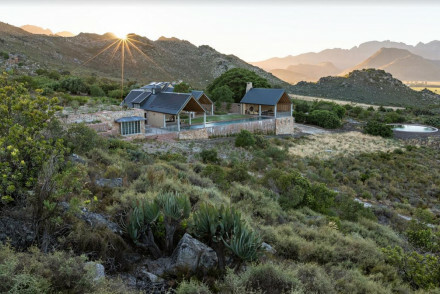 A Virgin Limited Edition property set in spectacular rural surrounds in one of South Africa's finest wine growing regions. Classically designed throughout with soft hues, clean lines and plenty of light. A fabulous restaurant makes for romantic evenings and glorious spa is utterly spoiling. Bliss. Country Escape - A tranquil property set amidst rolling vineyards and with epic mountain views. Luxury boutique hotel with quaint Dutch-style buildings and lush gardens. Stay in the self-contained cottage, villa or suites, with pools attached. The exemplary restaurant serves seasonal local produce with a great choice of quality wines. A serene base from which to explore this charming region. 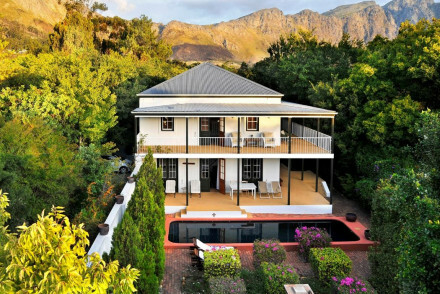 Akademie Street offers a variety of boutique suites and cottages in charming Franschhoek. 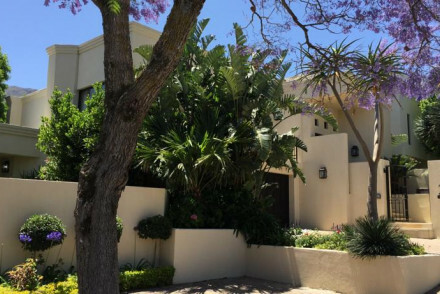 The property boasts elegant accommodation with chic interiors and wonderful views. Swim in one of the four pools or soak up the sun in one of their hot tubs! Enjoy full English breakfasts. A magnificent spot! Honeymoons - Elegant, intimate and wonderfully private cottages and suites surrounded by some of South Africa's best wine estates. Utterly beautiful interiors, sumptuous bathrooms, combined with fine dining and a great location. Each room is unique, decorated in deep colours and unique furnishings, some with private pools. You're just of Franschhoek's main high street, so you're walking distance from the action. 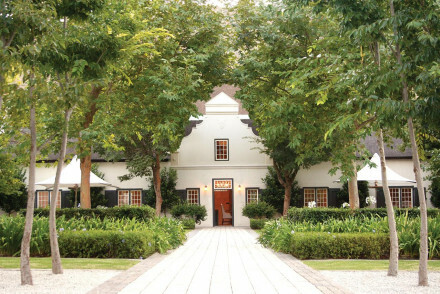 A quaint Cape Dutch style hotel, located right along picturesque Franschhoek's bustling high street. Family friendly, and walking distance from some of Cape Town's best restaurants, this 12-bedroom hotel is a perfect base, ticking all the right boxes. This opulent six-room right along Franschhoek's pretty high street. 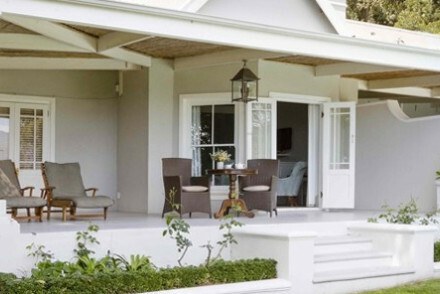 Unmistakable, in its Cape Dutch style, this grown-up accommodation is a stone's throw away from some gourmet restaurants. Beautifully appointed rooms include pool views and plenty of space to relax - perhaps with a massage? 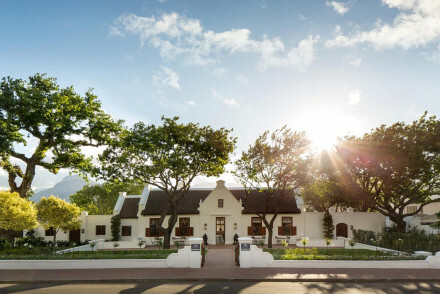 Located in the charming Franschhoek Valley, nestled amidst 68 acres of working vineyards lies one of South Africa's most luxurious new hotels. This elegant 19th century Manor House blends colonial and African interiors to great effect. Fine dining and fine wines complete the package. Divine. A visual feast, everywhere you look the eye falls on some exotic antique or painting. Each unique suite is decorated in the colours and fabrics of a maharajah's palace, a miniature Versailles or a Moroccan harem. Utter indulgence continues right through to the dining and the award winning spa. Restrictions on children - Children above the age of 12 are permitted.